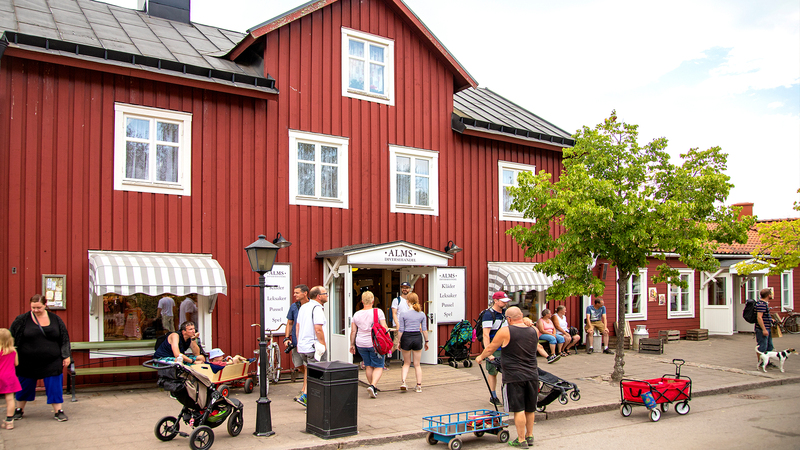 The most important shop at Astrid Lindgren’s World is, of course, the bookshop. It stocks most books written by Astrid Lindgren and several books about her, all featuring a label to show they were bought at Astrid Lindgren’s World. The bookshop is on Skolgatan/School Street, which you reach by staying left at the entrance. Bråkmakargatan/Troublemaker Street is also home to Alms General Store, our main shop with an extensive, varied range of clothes, toys, puzzles and games. Many of the products have been made exclusively for Astrid Lindgren’s World. A unique sweetshop selling not only lollipops and sweets but also Pippi’s chocolate money, never-grow-up pills and Karlsson’s special medicine. A real chocolate shop bursting with the aroma of chocolate. Choose from our range of handmade chocolate pralines, or why not pop in and take a look at our chocolate fountain? Everything for the Emil fan. ‘Mysse’ and ‘bysse’ and other fun stuff you’ll recognise from the books about That Emil. See how genuine rock candy is made, and buy good old-fashioned sweets. The Post Office sells postcards, stamps, towels, mugs, bedding and other bits and pieces for the home. Our village shop sells locally produced delicacies, cured meats, confectionery, food and nice handicraft.